New Managed Pages features that enable web site content to be updated, previewed, versioned, published, and rolled back. Enhanced, out of the box theme, modularized for design flexibility. Mobile experience theme that optimizes web content delivery to smartphones. Community Page support that enables social communication in context, where and when you need it. Analytics overlays that offer in-place, real-time web page and channel delivery analysis. Socially-infused web experiences with ready to use blogs, article templates and wikis. as a Facebook ID, extending web presences to new social channel audiences. Simplified, “in-place” upgrade from Versions 6.1.5 and 7. 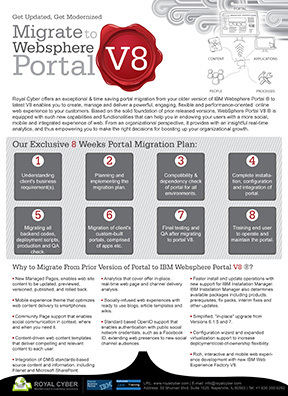 Rich, interactive and mobile web experience development with new IBM Web Experience Factory V8.